Often times when dining in Italian restaurants, vegetarians only get to scarf down on lettuce with a vinegar dressing and noodles dressed in basic tomato sauce. A pretty sad picture, don’t you think? Ladies and gentlemen, there are more plant-based options out there, believe me! 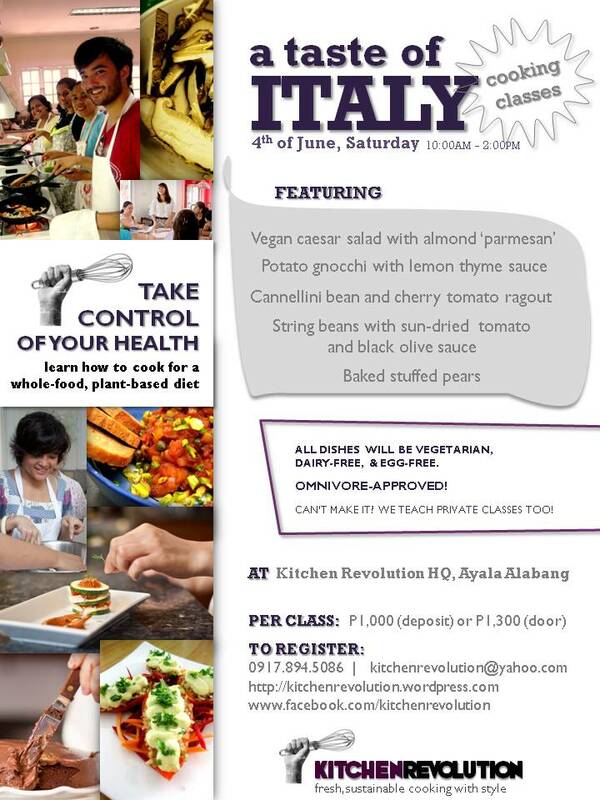 Attend this class and discover how to make a Caesar salad without eggs and anchovies. Make potato gnocchi from scratch and wow your family and friends the next time you cook for them. You’ll also learn how to make rustic, delicious cannellini beans and a string bean dish dressed with olives and sun-dried tomatoes. We’ll end the meal with a lovely dessert of baked stuffed pears.